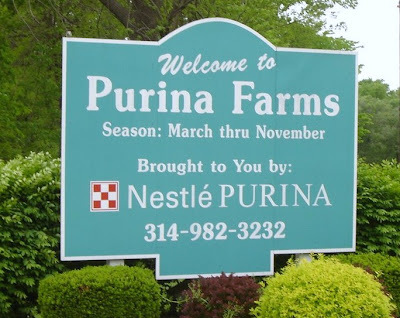 Early Saturday morning we headed to Purina Farms, located in Gray Summit, MO. We met Grandma and Grandpa Lee, Uncle Jason, Aunt Erin, Cousins Connor and Aiden. The sign that welcomes you to the farm. You then have to pass through security, and tell them your reservation time. Otherwise the visit is free! Ryan was having a great morning. He soon fell asleep, and slept through most of the visit, wrapped up in his blanket and hoodie! Happy as could be! We watched the diving dog and Frisbee dog show. This lab and pit bull mix really could "fly!" We really enjoyed watching him dive. The Labrador loved the water, and after every dive, she would swim around for a few minutes, as the pool was 80 degrees and she loved the water! Grandma and Pa-pa, walked with Mikey, as they entered the big barn. Mikey loved the miniature horse! I am sure he was trying to figure out how he could open the stall door, to get in there to pet or ride the horse, as it was just the right size for Mikey! Mikey really wanted to pet this chicken. One of the staff members held the chicken, and Mikey finally got to pet a real chicken. These two little pigs were having so much fun in their enclosure. They were playing with a rubber ball...Mikey really wanted to climb in there and play with them! Mikey and a very soft rabbit! This is Mikey looking at the bunny VERY close. Shortly after the picture was taken, he looked at grandpa, and said "No poke in eye." Not sure why he thought pa-pa, would do that but he thought it needed to be said! This was an exhibit that explained how much a draft horse could pull. You pulled the rope will all your strength, and it would give you a "weight," that you could pull if you were the horse. The 2nd floor of the barn had a children's play area, with a hay loft that had tunnels to crawl through. As you come out of the last tunnel, they have tables, filled with dried corn. They boys loved playing with the tractors and mini farm equipment! Mikey really liked the little green tractor with the front scoop. He didn't want to stop playing with it. Mikey on one of the peddle tractors. His feet barely touched, so he couldn't peddle by himself. Mommy pushed him, as he attempted to do one side. Poor kid really wanted to do it by himself. Aiden had a blast! Partly because he was able to go all by himself, as Connor was too tall! Grandpa, Mikey, and grandma at the dairy cow exhibit. Mikey wanted to milk the cow, until he had to sit on the farmers lap. He then freaked out and screamed "NO cow!" Aiden, Conor, and Mikey at the Koi fish pond. Mikey had a great day! Mikey and Grandpa are now clear on all of the NT fishing rules. It only took 10 minutes to catch a bass! Mikey was so excited! A short walk to the other side of the lake, and they caught another bass. This time Mikey wanted to touch it! Thanks grandpa for teaching me how to throw rocks, I mean how to catch fish! I can't believe you made us miss the duck race, Mommy! Ryan didn't mind...he was happy in the stroller. They have real rainbow trout in there! Mikey thought this beaver, was a rat. He screamed when he finally saw it. He was too busy looking at the trout in the water. Mikey growled at the bears, and wanted to know why he couldn't pet one! This monster catfish, has to weigh 70 pounds or more. Mikey also wanted to touch this fish. Mikey thought this was a horse, so it proves that we need to work on our animal identification skills. Apparently my kid, is lacking in that department! We visited Cabela's due to the rain, and because I messed up! I thought the rubber duck race was on Monday...and it was on Saturday. 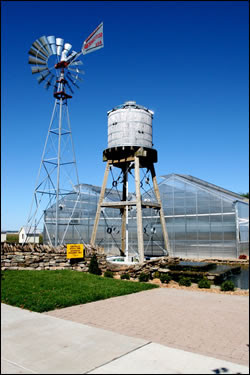 New Town has an organic farm. Mikey and Ryan like to see the farm animals. This little "cheeky," rooster, came right up to the stroller. The farm also has fainting goats. Too funny! The farm is very close. and Mikey loves to go for a walk, to "visit," the farm. Even if he swears up and down, that they also have monkeys! His shirt says "Happy Birthday two Me." When I went to wake him this morning, he really was sleeping like this! Think he knows, it is his special day? He loves to climb into the rocking chair, and "rocky-rocky." He does it almost every morning. He had to go to Toni's today, as Mommy had to work! Happy 2nd Birthday Michael Jr.! We love you SO much! Mikey watching a Thomas the Train movie before we leave for Toni's house. He pulled the pillows off of the bed, and made this little "chair," all by himself. Playing in a tent is always fun! Mikey loves his toy vacuum he got for Christmas. We needed to leave for the day, and this is the face I got, when i told him we needed to get dressed! Just because we have matching shirts and look really cute, does not mean that I am going to be happy with you about not being able to play with my vacuum! Michael Jr.'s 2nd birthday party theme was Thomas the Train! Mikey had a great party! He woke up early on Sunday morning, and said "PARTY!" It was so cool that he knew we were celebrating his birthday early, as his birthday is Friday 5/22. He loved the new Thomas the Train set he got from grandma and grandpa Fortner! He also received a T-ball and basketball set. He would slam the ball, and yell "score."